Sustainability is a Glenn Rieder promise. Delivering on sustainability requires a commitment beyond simply being aware of the products we purchase. Companywide we take the necessary steps to actively maintain our Forest Stewardship Council ™(FSC™) certification which allows us to follow the chain of custody requirements of an FSC certified project. Glenn Rieder is a proud participant in the Leadership in Energy and Environmental Design program, also known as LEED, which has become a cornerstone in building standards and environmental concerns. 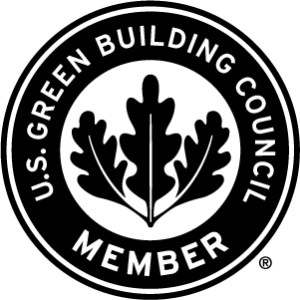 GRI employs certified LEED professionals across the company. This commitment allows us to stay in touch with the latest knowledge and best practices for sustainability in the construction industry. We encourage our customers to follow LEED practices and we actively assist in sourcing materials that are environmentally responsible. Glenn Rieder is a Forest Stewardship Council (FSC) certified company, abiding by the requirements of FSC Chain-of-Custody (COC). COC is the path taken by raw materials harvested from an FSC-certified source through processing, manufacturing, distribution, and printing until it is a final product ready for sale to the end customer.